Voters queue up to cast ballots in presidential elections in Luanda, Angola, Aug. 23, 2017. Defense Minister, Joao Lourenco was the front-runner to succeed President Jose Eduardo dos Santos, who will step down after 38 years in power. Angolans voted for a new parliament and president on Wednesday, but many say the balance of power in Africa's fifth-largest economy is unlikely to shift. Outgoing President José Eduardo dos Santos, who has ruled the country for 38 years, has left in place safeguards to ensure his legacy and influence, including the continued role of his daughter, Isabel dos Santos, as chief executive of the oil-rich nation's energy company, Sonangol. Dos Santos will also remain leader of Angola's ruling party, the People's Movement for the Liberation of Angola, or MPLA. Last month, the MPLA-controlled parliament enacted a law that will prevent the incoming president from removing heads of the country's army, security and intelligence services until 2025. A victory by the opposition would be a massive upset. The MPLA has ruled Angola since it won independence in 1975. In the 2008 election, the party won nearly 82 percent of the vote. In the 2012 election, it won nearly 72 percent. In stark contrast, the most powerful opposition party, the National Union for the Total Independence of Angola, or UNITA, received less than 20 percent of the vote in those two elections. Joao Lourenco, presidential candidate for the ruling MPLA party, waits to cast his vote in Luanda, Angola, Aug. 23, 2017. 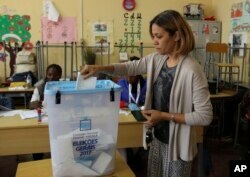 "I don't believe there is a chance of any change of power, except if the opposition parties are able to put their delegates in every electoral precinct," Luaty Beirão, a prominent Angolan activist and musician, recently told VOA Portuguese. "If they can be able to monitor and control the whole process before and after the actual voting act, then maybe the result can be more balanced." Despite such predictions, there have been warning signs that Angolans are not happy with the MPLA. Angolan investigative journalist Rafael Marques de Morais, a longtime critic of the government, reported that the office of the presidency commissioned a poll earlier this month to gauge people's sentiments ahead of the election. For the ruling party, the results were damning. Just 38 percent felt the MPLA would win the election, while 91 percent believed MPLA leadership acted in its own interest, and a similar number said the government's performance was "bad" or "very bad." Brazilian firm Sensus Pesquisa e Consultoria conducted the survey of 9,000 people in all 18 provinces, according to Marques de Morais. The dissatisfaction most likely stems from economic concerns and perceived government wrongdoing. Because of falling oil prices, Angola's economy has declined sharply since 2014. Three years ago, the country's gross domestic product was nearly $127 billion. Since then, it's decreased by nearly 30 percent. Last year, Sudan's GDP surpassed Angola's for the first time in over a decade. Even when the economy was booming, most regular Angolans did not reap any benefits from the oil riches. Rather than build infrastructure or improve basic health services, opposition groups say, government officials diverted funds into their own bank accounts. "Health and education were left completely unattended and, above all, there is the phenomena that overlays any other, which is corruption," Beirão said. During the campaign, opposition parties also questioned the fairness of the election process. Sylvia Croese, a research fellow at the African Center for Cities and the Department of Sociology at the University of Cape Town, told World Politics Review, an international affairs publication, that promises of equal treatment weren't being met. A voter casts her ballot in elections in Luanda, Angola, Aug. 23, 2017. "There is significant concern in Angolan civil society about the ability of opposition parties to make their voices heard," she said. "For instance, all parties are entitled to receive about $1 million from the state for campaign purposes, but the opposition only received them in July, with the elections slated for August 23." All parties are guaranteed equal airtime on public media to campaign, Croese said, but independent research showed that the MPLA received far more coverage on both public and private media. "Opposition parties, especially UNITA, have repeatedly denounced and protested the National Election Commission's absence of transparency and accountability," Croese said. Between the 2008 and 2012 elections, a time when the economy was booming, political engagement shrank. Voter turnout decreased by 25 percent, despite increases in both registered voters and the overall population. But before this election, many Angolans expressed enthusiasm about voting, partly because they could choose a new president. About 93 percent of the population, those 54 and younger, weren't yet born or were only children when dos Santos first rose to power. Dos Santos is almost the only president they've ever known. For Angolans, that made Wednesday's election an unprecedented chance to vote for a new leader. Substantive change, however, is far from certain. Barbara Santos, James Butty and Mariano Bartolomeu contributed to this report.